The Tiger I is probably the most famous and feared tank of the Second World War. It was designed as a "breakthrough" weapon, and it featured extremely thick armor and an 88mm KwK 36 cannon. For over 2 years there wasn't a single Allied tank able to match it on the battlefield. Its dimensions were impressive: it was over 27 feet long, over 12 feet wide, and it weighed over 50 tons. The hull and superstructure armor were 100mm thick, the hull sides were 60mm thick and the superstructure sides and rear plate were 80mm thick. Its heavy weight necessitated interleaved road wheels on an overlapping torsion bar suspension, in order to achieve the proper ground pressure. A five man crew operated each Tiger I.
Henschel und Sohn of Kassel built 1,354 Tiger I tanks during its two year production run from July 1942 to August 1944. Maybach provided the 650 hp HL 210 P45 V-12 gasoline engine. The more powerful 700 hp HL 230 P45 replaced the HL 210 at the end of the 1943. The Tiger was subject to continuous running changes to components such as its turret, mantlet, commander's cupola, crew hatches, etc. which led to variant designations such as "Early," "Mid" and "Late." It's very important to have access to photographs of the tank you wish to model when they're available, in order to confirm the myriad of detail differences from one tank to another. The kit comes in Dragon's customary cardboard box with a nice rendering on top. This is a complex kit as you might expect. It consists of approximately 301 parts. 293 of these are injected molded on 19 sprues, plus the hull. 21 parts are clear plastic. 170 parts are surplus and go unused. A single photo etch fret contains 4 additional parts. There are 2 "DS" tracks, 2 metal parts and a small decal sheet. All of the parts are bagged. The molding of these parts, with Dragon's new "slide mold" technology is impressive. 1) 13.Pz.Regt, LAH, Prokhorvka, Operation Citadel, July 1943. Dark Yellow with Green field-applied camouflage. 2) s.Pz.Abt. 101, Zhitomir, November 1943. Dark Yellow with Green/Brown field-applied camouflage. 3) Pz.Abt.503, 1943. Dark Yellow with Green field-applied camouflage. 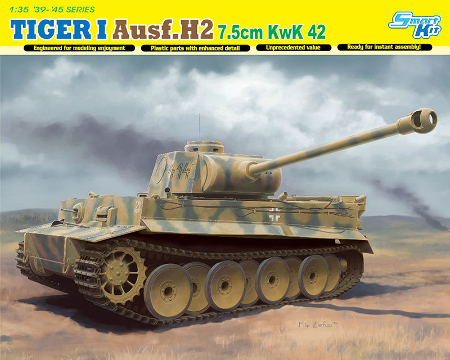 Noted armor modeler Cookie Sewell has pointed out that the "H" designation refers to the fact that the kit comes with a Henschel turret, which was actually intended for the Panther tank. This turret has the Panther "A" style mantlet and "dustbin" style commander's cupola. This is a very well executed kit of a tank that never saw combat. It's therefore somewhat of a mixed bag, albeit a well executed one. I would like to thank Dragon Models USA for the review sample.